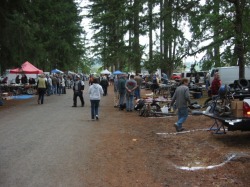 The Annual Tenino Swap Meet and Show will be coming at you the third full weekend in August. More vendors, more buyers, more bikes, a special back roads ride, the Tenino Motorcycle Drill Team performance, and a Custom Car Show on Sunday. Free admission to all activities (unless you are a vendor). Set up starts on Friday afternoon, the swapping begins shortly after and continues through Saturday night or until the last vendor packs it up and heads home on Sunday. This is a very special Sunset Coast event, you won't see the wide selection of antique parts both used and OEM anywhere else in the Pacific Northwest. Plus we have some of the best riding country in the USA! Plan on joining us in August this year and see why we have been doing this for all these years!